Great strategy must address the key needs of customers, then build an organisation around delivering those needs better than the competitors. Insight allows us to build a depth of understanding upon which customers can be segmented then targeted. 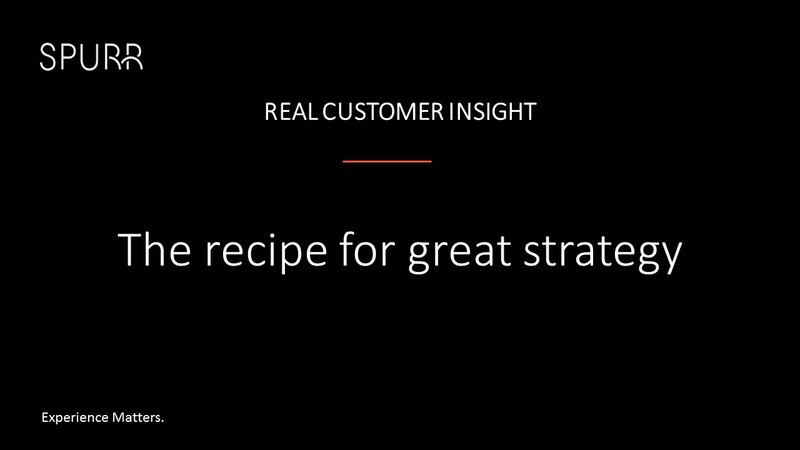 Below is how to ensure strategy is anchored in the customer. The customers’ motives should be the starting point of any strategy work. The search for products is driven by the benefit that customers are looking to realise and this is led by their motives. These motives can be complex (higher status, valued etc.) or relatively straight forward such as fear of be fired for making the wrong decision. It’s often said that people look for emotional or rational benefits, in practice this is a bit of a red herring as most decisions are ultimately linked to an emotional benefit. Those businesses who have ever pitched for contracts through a procurement process know that the rationally better bid doesn’t always win! To get this insight external market research helps, but in many markets today a deeper understanding is needed. To achieve this try ‘walking a mile in the customers’ shoes’. Starbucks’ recent ‘Upstanders’ initiative is born out of desire to have a much more personal relationship outside of the core service. Once you know the core motives for customer you can then look at other ‘secondary’ needs; this is mainly how, when and where something is bought (and used). Although not the fundamental reason for purchasing, it can frequently be the deciding factors that, if a company addresses, will gain them a competitive advantage. For example, it is argued today that the core offer provided by professional service companies is no longer the main point of differentiation, it more the ‘softer’ side of the client experience. These NEEDS are gold dust: Critical Success Factors that by addressing better than the competition are a key part of the business strategy – COMPETITIVE ADVANTAGE. What people buy is critical of course, but merely a result of satisfying the benefits customers are looking for i.e. the actual products and services. Being fixated by the features in the market can reinforce the status quo. Market leadership comes from making no assumptions about how things are; rather start with what the customers need then create the service around it. To size the market and contact businesses, you need to profile the customers to understand where and who they are. With many B2B markets it’s not sufficient to know who the target company is, you also need to know who’s in the decision-making unit. The best competitive strategy comes from this approach to segmentation, and this means insight. Focusing on WHY first enables a company to build its business strategy around client needs and that’s REAL INSIGHT.